Doctors and nutrition experts are touting the value of adding whole grains to your diet. 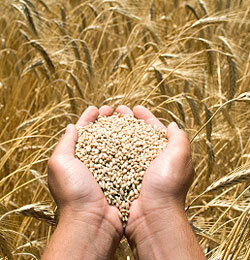 Research suggests that whole grains can promote heart health and help control diabetes and weight gain. But what are whole grains, and how can you add them to your diet. According to the Whole Grains Council, whole grains have all three parts of the grain: the bran, the germ and the endosperm. When grain is refined, the bran and the germ are removed – along with about 25 percent of the grain’s proteins and 17 important nutrients. Even though some refined grain is enriched, with some nutrients added back in, whole grain remains healthier for you. The USDA guidelines say that Americans should get at least half their grains as whole grains – that is about three to five servings of whole grains a day for adults. More than that is even better, according to both the USDA and the Whole Grains Council. The most common form of whole grain is whole wheat. A generation ago, most of the bread we ate was white bread, made from refined flour. Increasingly, though, people are turning to whole wheat bread. If you are buying whole wheat bread, make sure that it includes whole wheat flour as a primary ingredient. Some bread is called “wheat bread,” but it is made from refined white flour with some molasses added to get the brown color. Breakfast cereals, muffins and other common foods are being made from whole grains, in response to growing consumer demand for healthier food options. Look at the ingredients to identify whether a food is made primarily from whole grains. Oats. Unlike with other grains, the bran and germ usually are not removed when oats are processed. So almost any oats are whole grain, whether they are in steel-cut oatmeal for breakfast or oatmeal cookies for dessert. Barley. You can find hulled barley at health-food stores, although it is very slow-cooking. Pearled barley is not a whole grain because it is missing some of the bran, but it still is a better choice than a more-refined grain. Buckwheat. It’s not just for pancakes anymore. Although technically not a grain, but rather a relative of rhubarb, buckwheat has a nutty flavor. Bulgur. Bulgur is wheat that has been boiled, dried, cracked and sorted by size. It is common in Middle Eastern dishes such as pilafs and tabbouleh. Rice. Most whole grain rice is brown, although it can be other colors; it is the healthiest rice option. Converted rice is healthier than refined white rice, because it is parboiled before being refined, so not as many nutrients are lost. In addition, rice is among the most easily digested grains. Rye. Long a staple of the deli sandwich, rye bread is another good way to get your whole grains. Quinoa. Like buckwheat, quinoa is not really a grain but rather is related to Swiss chard and beets. Originally grown by the Inca in the Andes, quinoa can be made as a side dish or added to soups, salads and other foods. It has the added bonus of being a complete protein, with all the essential amino acids we can’t make on our own.